Application, Program, Process, Service, Thread; What Does it All Mean? The meaning of these terms is very confusing, especially when they are used interchangeably. And they actually do have overlapping meanings. Lets start out by defining a program as any code that runs on a computer. So all of the above are programs. A program that displays a windows or an interface to a user, and probably performs a function for the user, is called an application. A process is a unit of code that, when it executes has its own unique ID and its own specific protected area of RAM memory for its actively running code and where it stores its temporary data values. A running program or application can be considered a process, but generally an application has a user interface, while a process runs in the background without displaying a window or user interface. An application, being a process, when it executes also has its own unique ID and its own specific protected area of RAM memory. An application can also write its data to a shared RAM memory area, or to a more permanent storage area such as a hard disk. A service (called a daemon in Linux. Daemon is a Greek word for a supernatural being working in the background) is a program that runs in the background and does not display a window or user interface. But a service is technically similar to an application in that they both can run multiple processes to accomplish their tasks. Actually a process can call other processes, and the chain of processes running from the first calling program is called its "process dependencies". 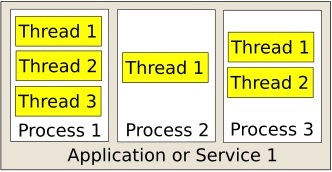 The term thread stands for "thread of execution" and is simply a program's instructions executing. A program, be an application, service, or process, can have multiple threads executing concurrently. With a single-core processor, there is little or no advantage to having multiple threads executing concurrently, but with a multi-core processor, each thread can run on its own processor, resulting in a gain in speed. Although applications, services, and processes are all pretty much the same thing, generally if its a program that displays a user interface, you should call it an application. A program that doesn't displays a user interface, you should call a service. Both applications and services can run multiple processes. A process is like a little servant that doesn't have a user interface, but instead has interfaces to communicate with and run at the beck and call of applications and services. Now when someone says that an application like windows notepad is a process, and then opens Task Manager, which lists under the services column, notepad's executable (notepad.exe), it's hard to argue with them.